Today is Things That Make Your Heart Melt Day. The first thing that makes my heart melt is my oldest son Matthew. It’s his birthday today, but he lives far away and so I won’t see him on his birthday, though I will talk to him on the ‘phone. Matthew is such a good boy and such a smart boy and such a sweet papa, that he just melts my heart. Ouch. It hurts to love somebody so much, sometimes, doesn’t it? 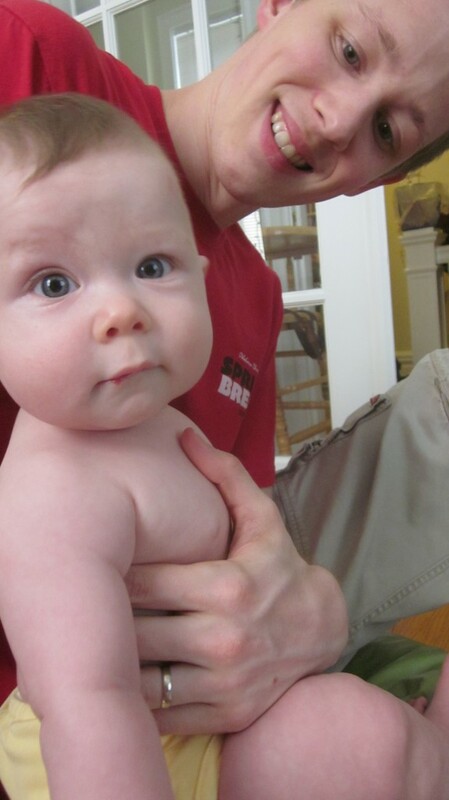 Actually his little boy-o Emmett is the second thing that makes my heart melt. Here’s my boy Matthew with his little boy-o Emmett. Ten months is an awfully long time, Gentle Reader, to wait. Although now, with the hoop house up and nearly covered (don’t worry, I’m working on a post about it), with those two lovely half-grown tomato plants in there, I’m anxious to see how long we’ll have heirloom tomatoes past the October 10th frost date. The rest of my plants, in the garden proper, will die a quick and sad and blackened death, one night when the temperature dips down into the 20s. But those two plants, protected by one layer of plastic, with the warmth from the ground radiating upwards . . . who knows? I might have fresh tomatoes into November, anyway. And then in the spring, I’ll be able to again tuck a few tomato plants into the hoop house earlier than our May 10th frost-free date. I dare not plant anything as delicate as tomato plants in the main garden any earlier than that. So there’s always hope for a few more weeks of the delights of fresh heirloom tomatoes. Next year, that is. See? See? Aren’t they pretty? Do I hear an “Amen” from the audience? One of my favorite ways to eat these tomatoes fresh is in a delightful (if I may say so, myself!) marinated tomato salad. The nice thing about this salad is that is gets better and better, as it sits in your refrigerator. It’s good the first day. The second day, it’s even better. The third day . . . it’s sublime. The flavours (hat tip to my friend Anita-Clare Field, who spells the word “flavours” with the u, and just published a new cook book this week!) mix and meld and the tomatoes mingle with the herbs and–ooh, baby!–but you don’t have to take my word for it. Jump on out to your own tomato patch (the tomatoes don’t have to be heirlooms, but there are lots of reasons that you ought to grow them next year, if you didn’t this year) or hop on down to your local farmer’s market (if you’re lucky, you’ll find them there!) and bag up a few for this salad. Pick out a nice color selection, though. There’s no fun in using only red tomatoes in this salad! Oh! 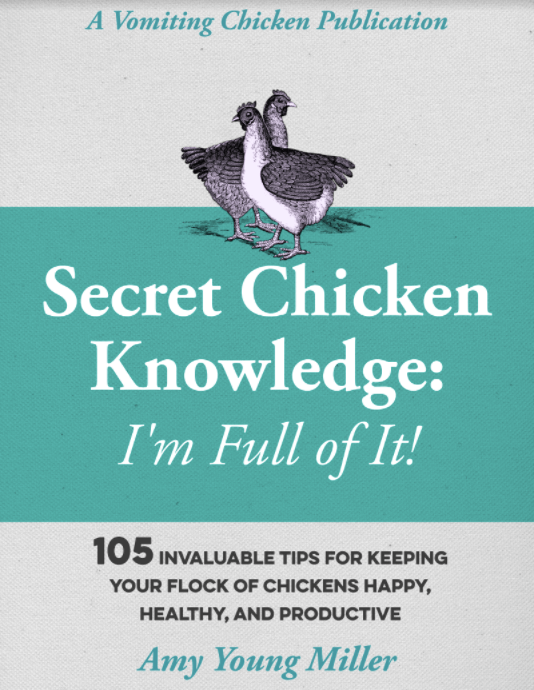 Are you wondering why there is a picture of chickens in here? 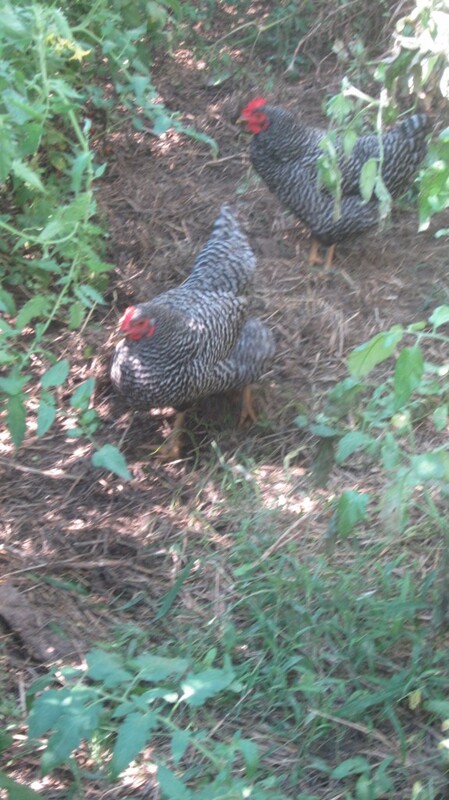 As I went out in my tomato jungle this morning to pick tomatoes, these two little ladies were creeping around in there. They were so quiet . . . scratching and rooting about, I just knew that they knew that they were not supposed to be in there. I tried to take some decent pictures (as you can see, I failed) but they were a bit shy, and they scuttled off, after a fashion. Hopefully to eat the beetles chewing on my squash plants, for Pete’s sake. Now I’ll leave you with two more gifts, from me to you, on this auspicious Things That Make Your Heart Melt Day. Have you ever seen anything so beautiful? Take this to a potluck or a barbecue and just prepare yourself for the compliments and the oohs and ahhs. Instant fame!! This salad is a lovely addition to your fall barbecues, and it actually gets better with a day or two in the 'fridge! Combine tomatoes and onions and peppers in a big glass bowl. Combine the rest of the ingredients, except for the parsley/cilantro, and mix well. Pour over tomatoes and onions. Cover and refrigerate 2 to 4 hours, basting occasionally. To serve: sprinkle with parsley and/or cilantro. Side note: if you keep it in the refrig overnight or longer, it will get juicier and juicier, and you may want to pour off the excess liquid to serve. Save it for another salad or use in a stir-fry! 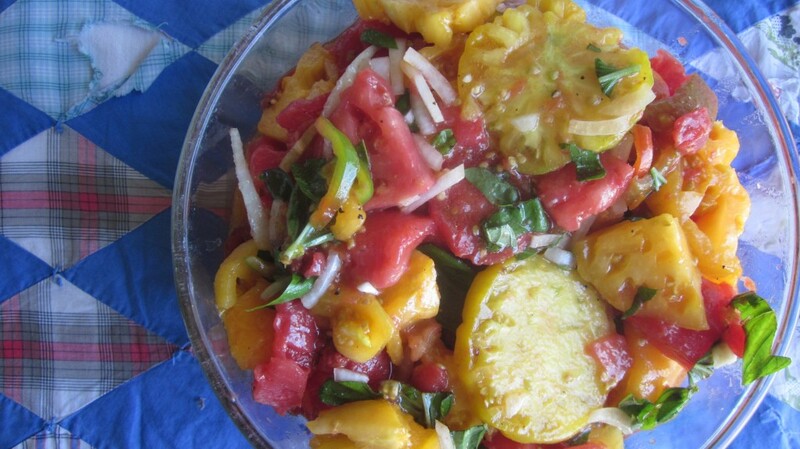 Enjoy your lovely heirloom tomato salad, while you can, won’t you? 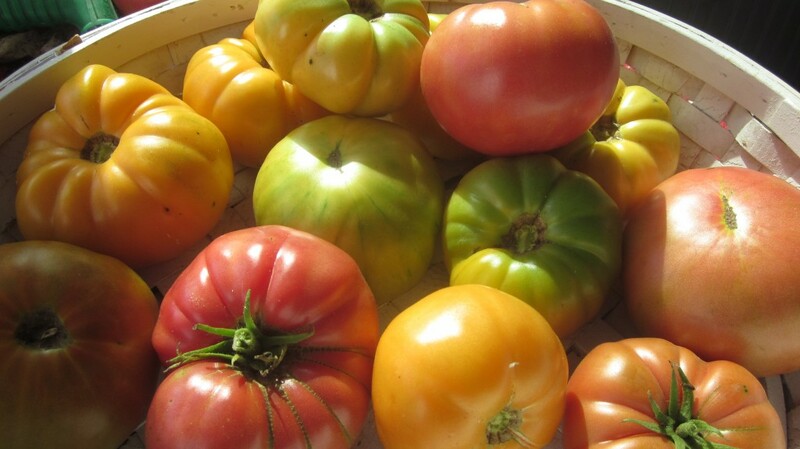 Because heirloom tomatoes, just like these gorgeous, golden fall days, will not last forever, Gentle Reader! Oh, by the way, I’ve linked up with The Prairie Homestead’s weekly Blog Hop right here. Check it out! Thank you Anita-Clare! 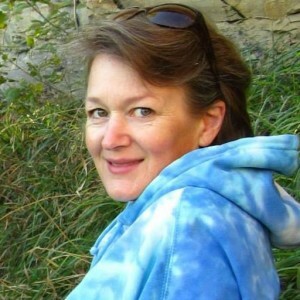 I’ve learned a great deal from your blog and I’m sure I will from your new cookbook, too! This looks oh so tempting, and I can perhaps finely dice one of my “Extra” jalapeno peppers and sprinkle over the top…….yum. Tomatoes here in Mexico can be purchased from local farmers and have the home grown taste or like I see so many people do, the standard no flavor ones can be purchased at stores like walmart. Yes “Progress” is coming to a store near you here in Mexico. Nice hat-tip to our friend Anita-Clare! The prepared tomatoes look amazing but the ones in the basket look too pretty to eat! Your photos are beautiful of those lovely tomatoes and the salad. It looks amazing. Thank you for the recipe and for making it printable! Thanks for stopping by and for the nice comment, Suerae! Sounds yummy – sadly our tomatoes are basically done here. Late blight has done its work, as it almost always does. File for next year… but do you know what I do with any marinade my husband makes for tomato salad? After the salad is eaten, I drink what is left. I don’t think he has ever made one with dry mustard. I’ll be pinning this. My mom does the same thing! It’s tomato juice and herbs and all kinds of yumminess, why not? I’m going to miss those fresh tomatoes, too. But, since I am a mozzarella and tomato guy (sometimes gruyere and tomato guy)- Im sure the reduction of cheese in my diet may be a good thing. Yum, mozzarella and tomatoes: the perfect marriage! Yum! What a delicious recipe! Caro, I suppose you could leave the raw onion out . .